The hunt for dark matter will gain a more-than-an-order-of-magnitude boost in detection sensitivity when the next-generation XENON1T detector achieves first light this autumn. The challenges of constructing the world’s largest direct-detection dark-matter experiment and the scientific prospects for the future were presented by project spokesperson Elena Aprile of Columbia University, US, at the April Meeting of the American Physical Society in Maryland last weekend. The XENON experiment began 10 years ago with XENON10, a 25 kg tank of liquid xenon deep under a mountain at the Gran Sasso National Laboratory in Italy. XENON100 followed in 2008 with 161 kg of liquid xenon and more than a hundred times the sensitivity of its predecessor. As the latest iteration, XENON1T is far more than a “second generation” detector – it contains 3300 kg of xenon and another hundred times the sensitivity of XENON100. The world’s current limit on the dark-matter interaction rate was set in 2013 by the Large Underground Xenon (LUX) detector in South Dakota – a limit that XENON1T is expected to surpass by about a factor of 40. The goal of most direct-detection dark-matter experiments is to observe a weakly interacting massive dark-matter particle (WIMP) as it scatters off the nucleus of an atom. If dark matter is a particle at all, then WIMPs are our current best candidate. XENON1T has been designed to be particularly good at detecting heavy WIMPs with masses of 50 GeV and above. “Direct detection is very simply looking for the scattering of a WIMP with a nucleus in a detector, so that we can measure its energy. Our first challenge is that the energy you expect is extremely low,” explains Aprile. While the observation of such scattering events has yet to be confirmed in any detector, physicists can put limits on certain properties of WIMPs by running experiments for several years. Aprile told physicsworld.com that “only a week of data with XENON1T will be sufficient to reach the best limit we have today on the spin-independent WIMP-nucleon cross-section”. Current detectors would have to run for centuries to achieve the same projected sensitivity as XENON1T, which, combined with a planned extension in 2018, will be the most sensitive dark-matter experiment for “quite some time to come”, she says. Apart from the challenge of actually detecting a WIMP, dark-matter detectors must also account for background noise that arises from a variety of sources such as cosmic rays and radioactivity. “Above all, the holy grail in this business is a very low background,” says Aprile. Indeed, XENON1T will have the lowest background rate in the world thanks to the natural shielding of the Earth above the detector, and further shielding from the four metres of water that will surround the xenon tank. The water tank will make it possible to rule out false signals that come from muons as they emit telltale Cherenkov light in water, unlike a WIMP. The xenon tank itself will be equipped with light-catching photomultiplier tubes, specially designed to operate in liquid xenon, to accurately pinpoint a dark-matter interaction. Collecting, purifying and storing several thousand kilograms of xenon is a major task in itself. “Running the cryogenics for more than a year has never been done before and is not trivial,” says Aprile. An entirely closed system is vital to preserve every last gram of expensive gas. 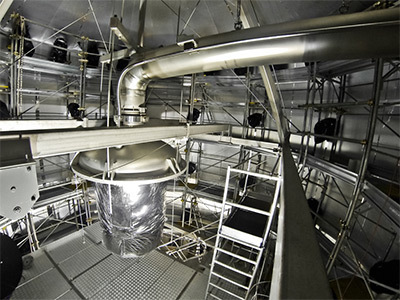 A new service building attached to the detector will provide the cooling, purification and safe recovery of xenon in the case of any emergency, such as an earthquake. XENON1T is now in an advanced stage of construction, and detector commissioning is expected to begin this June. First data collection begins this autumn. Our current picture of dark matter includes many different theories and, as Aprile comments, a “zoo of candidates”. XENON1T, and its 2018 expansion into XENONnT, will set the lowest limits yet on dark-matter interaction. She adds that the direct search for dark matter with laboratory detectors is a relatively “cost-efficient field” where modest experiments “have the potential to truly transform our view of the universe”. This entry was posted in ASTROPHYSICS, COSMOLOGY, DARK MATTER, High Energy Physics and tagged XENON1T. Bookmark the permalink.